The Cheezland Uke Band (CLUB) is organized as a non-profit group in the State of Wisconsin. One of the requirements of our bylaws is to hold an annual meeting of the membership. Look for an announcement in an email if you've given us your address. 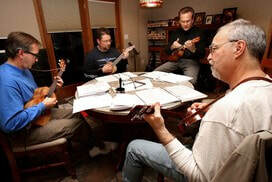 November 2, 2010 - This picture was taken a week after the La Crosse Tribune published a story about the new ukulele club. The story was a call to action for all people interested in learning how to play the ukulele to join the club. About 27 people attended our first meeting. just prior to publishing their story about the band entitled, Ukulele U. 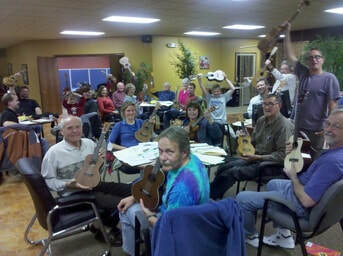 ​The founders of the Cheez Land Uke Band are: Tim Schneipp in the blue shirt at the far left. Corey Schwan seated to Tim's left. Dave Simpkinson is closest to the camera.